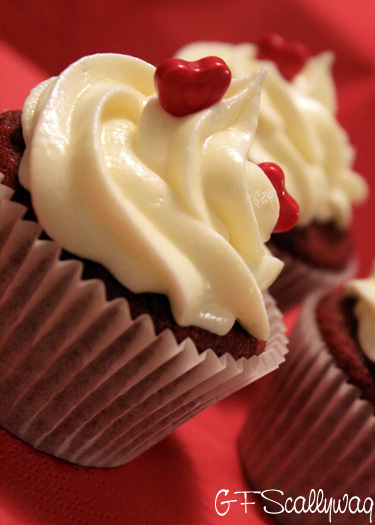 I've seen these little Red Velvet Cupcakes all over the internet, at local cafes and farmers markets, but am yet to find a gluten free version. So, what does one do when they run out of patience and can't find a gluten free red velvet cupcake at a cafe close by or even a gluten free recipe? Why, make one yourself, of course! Plus, added bonus these little bundles of red, chocolaty goodness are just in time for a loved up Valentines Daytreat this Sunday - happy baking! In a medium bowl sift together flours, salt and cocoa. In a mixing bowl beat butter until light and fluffy. Add sugar and vanilla, beat until combined. Add eggs one at a time, beating well between each addition. Combine buttermilk and food colouring. Add to butter mixture in three batches, alternating with the flour mixture. Scrape sides and beat until well combined. In a small bowl allow the bi-carb soda and vinegar to froth up. Add to batter and fold through. Spoon batter into 16 lined patty pans. Bake for 20-25mintues until skewer comes out clean. Allow to cool for ten minutes in tray before removing and cooling completely on wire rack. Cream butter and cream cheese until light and fluffy. Add icing sugar in three batches, beating well between batches. Add rind and beat for 2-3minutes until light and creamy. 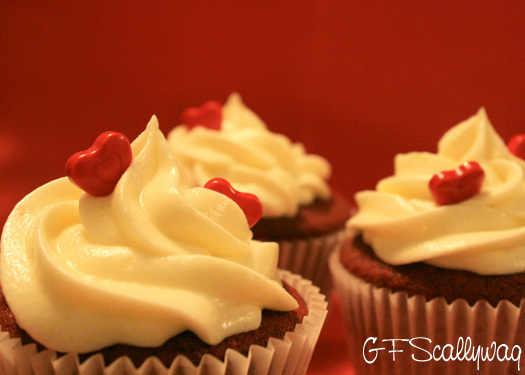 Pipe or spread icing on cupcakes. Decorate with gluten free candies.